Part 1 Physiological responses to biomaterials: Tissue responses to implanted materials; Blood interface biomaterials; Biocompatibility of cardiovascular devices. Part 2 Clinical application of biomaterials: Developments in cardiovascular valve technology; Percutaneous cardiovascular valve replacement; Cardiopulmonary bypass technologies; Cardiovascular stents; Vascular implants for peripheral arterial bypass and aortic aneurysm repair. Part 3 Future developments: Nanotechnology and nanomedicine in cardiovascular therapy; Biomaterials in cardiac restoration therapy; Biosensor technology in the treatment of cardiovascular disease; Vascular tissue engineering. Cardiovascular disease is one of the leading causes of death in the world today. Thanks to major advances in circulatory biomaterials and medical devices over the past few decades, many complications of this prevalent disease can be managed with great success for prolonged periods. Biomaterials and devices for the circulatory system reviews the latest developments in this important field and how they can be used to improve the success and safety in this industry. Part one discusses physiological responses to biomaterials with chapters on tissue response, blood interface and biocompatibility. Part two then reviews clinical applications including developments in valve technology, percutaneous valve replacement, bypass technologies and cardiovascular stents. Part three covers future developments in the field with topics such as nanomedicine, cardiac restoration therapy, biosensor technology in the treatment of cardiovascular disease and vascular tissue engineering. 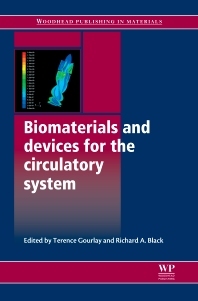 With its distinguished editors and international team of contributors Biomaterials and devices for the circulatory system is a vital reference for those concerned with bioengineering, medical devices and clinicians within this critical field. Terence Gourlay is Professor of Medical Diagnostics in the Department of Biomedical Engineering at University of Strathclyde, UK. Dr. Richard Black is a faculty member of the Department of Bioengineering at the University of Strathclyde, Scotland. Dr. Black is internationally acclaimed for his knowledge and contribution to cardiovascular bioengineering and medical devices.